The fact that Italian filmmaker Paolo Sorrentino has set his latest film, “Youth,” at a spa in the Swiss Alps is on one hand a treat, and on the other, a distraction. A kinetic sensualist whose last film, the elegantly stunning Oscar-winner “The Great Beauty,” flirted with direct comparisons to Fellini’s Eternal City adventures, Sorrentino knows his way around a gorgeous location. But in crafting a quieter, sadder meditation on aging amidst so much snow-capped stillness, he winds up lulling us visually at the expense of a cohesive or enticing emotional journey. 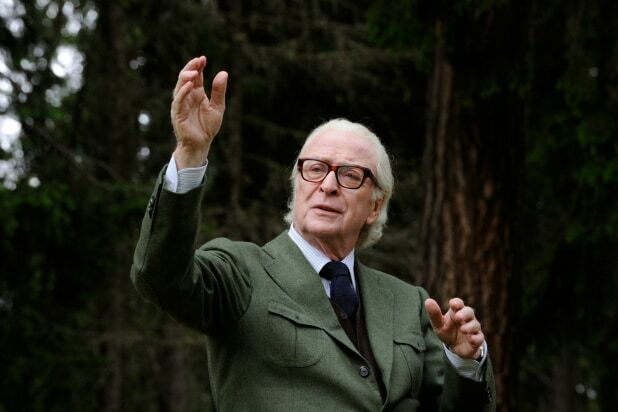 Our pillar of a protagonist is Fred Ballinger (Michael Caine), a lauded composer-conductor and hermit-like retiree; we’re introduced to him as he’s refusing a request from an emissary (Alex McQueen) for the Queen of England to conduct his signature piece at a special concert. Elsewhere on the grounds of his favorite vacation spot is longtime pal Mick Boyle (Harvey Keitel), an American movie director sweating out screenplay revisions on what he fears is his last big film. These two are tied not just by friendship, but also marriage: Fred’s daughter Lena (Rachel Weisz), who’s also his assistant, is married to Mick’s son (Ed Stoppard). Fred and Mick like to tease each other about conflicting memories, hash over lost pleasures, and muse about the passage of time. Surrounding them are the petty agonies of the young and successful, namely a movie star (Paul Dano) stricken by the fear of typecasting, a Miss Universe (Madalina Diana Ghenea) who wants to be an actress, and Mick’s screenwriting acolytes holed up in his room. Eccentrics dot the background, too, including an obese South American ex-footballer (Roly Serrano) with a massive tattoo of Karl Marx on his back. But lying in store for these two old friends are bitter truths via the women in their lives, whether it’s Lena’s bottled-up feelings about her philandering father’s treatment of his wife, or Mick’s frequent leading lady Brenda (a garishly assembled, blonde-wigged Jane Fonda), who arrives in the third act for a coarse diva-versus-director smackdown that recalls the brittle, powerful performances that made Fonda a ’70s powerhouse. All this takes place at a coolly swank Alpine hideaway — once the sanatorium where Thomas Mann was inspired to write “The Magic Mountain” — that Sorrentino and cinematographer Luca Bigazzi film as a spotless and arid way station on the road to oblivion. This sparsity may be some winking statement about the vanishing mind, but more often than not it works against the general lightheartedness everywhere else, as we’re meant to be drawn into the brains of a pair of fading satyrs, fairly buzzing with the trappings of decay and doubt. Not that Caine and Keitel aren’t the kind of actors whose faces tell stories, no matter what’s going on around them. Keitel hasn’t been this enjoyably wistful in years, and Caine is sort of his own mountain of acting prowess: by just being there and carefully doling out epigrammatic dialogue, he suggests the many vicissitudes of a long life. For many, even Sorrentino in low gear is the kind of art-house excursion worthy of a trip to the movies. (And the big screen is where he was born to play.) But if “The Great Beauty” was a heady, humming party you wanted to live inside, “Youth” — its melancholy and splendor too often at odds — never rises above feeling like a pretty, meandering gallery show. After failing to captivate audiences and critics, Brad Pitt and Angelina Jolie’s "By The Sea" will live on as a vanity project versus an interesting lens on the world-famous couple. "Jem and the Holograms" looked troubling from the start when fans noticed the beloved ‘80s cartoon was given a contemporary makeover. Ultimately, this bird won the worst box office opening of the year, with a paltry $1.4 million opening weekend. Bill Murray finally proved he wasn’t bulletproof, as Barry Levinson’s "Rock the Kasbah" translated as self-indulgent and, unfortunately, seen by few. Despite millennial obsession Zac Efron and voluptuous model Emily Ratajkowski, "We Are Your Friends" wound up standing alone and irrelevant. The Cameron Crowe film was seemingly doomed once exchanges about its making was included in the Sony hack. But who could’ve anticipated movie stars like Bradley Cooper and Emma Stone would ever have such a flop on their hands? "Mortedcai" was sourced from the cult novel and cast with Johnny Depp and trusty “Iron Man” leading lady Gwyneth Paltrow. But its mustachioed shtick lured absolutely no one. Proving yet again that a Marvel project nurtured outside the walls of Disney does not resonate quite the same, Fox’s “Fantastic Four” didn’t just overcook -- it burned the house to the ground. "Jupiter Ascending" wasn’t just overdone — it burned three stars in the process: a previously infallible Channing Tatum, a lured-from-motherhood Mila Kunis and a newly-minted Oscar winner in Eddie Redmayne. The Happy Madison Productions film was crushed by critics for its absurdity, and also bombed at the box office. It had a production budget of $88 million but only made $79 million domestically. Fans were upset that another Disney classic was being remade into a film that turned out to be disappointing - the only thing that saved the film was its colorful set design. With terrible reviews, many criticized the film's lack of comedy although both stars are stellar comedic actresses. The film opened to a meager $4.2 million in May. The TV to film adaptation was highly-anticipated, but disappointed fans in the end -- it holds a Rotten Tomato score of 32 percent and barely broke even at the box office. Not even the film's stellar cast, including Chris Hemsworth and Viola Davis could save the movie from bombing. Critics blasted the scripts and the actors, bringing its rating to 34 percent.